Matias has long been known for its excellent Tactile Pro Keyboards ( ; $150), now in their third generation. For many people, the Tactile Pro is the closest you can get to Apple’s venerable—but long discontinued—Extended Keyboard, thanks to Alps mechanical key switches that require a decent amount of force to press but that repay the effort with excellent tactile response and the visceral, clacky sound of a “real” keyboard. But for many Mac users, both the Tactile Pro and the Quiet Pro present a couple challenges. First, they’re both huge as keyboards go. In a market where Apple and many other vendors have done their best to make keyboards as compact as possible, Matias’s offerings remain unabashedly thick, wide, and heavy, with a full complement of keys, including a numeric keypad. Second, while more and more peripherals have gone wireless, the Tactile and Quiet Pro are still tethered to your Mac via USB. Matias’s latest offering, the $170 Laptop Pro keyboard, answers these challenges by being considerably smaller than its siblings and by connecting using Bluetooth. However, it’s still, at its heart, a Matias keyboard, with mechanical key switches—the “quiet” ones found in the Quiet Pro—and a characteristically chunky design. Because it uses Bluetooth, the Laptop Pro can also pair with iOS and Android devices, as well as Windows PCs. 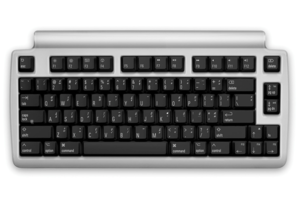 However, the Mac-specific, special-function F-keys, described below, serve fewer (or no) special functions on devices other than a Mac. Matias says the Laptop Pro’s battery takes roughly 5 hours to charge from a computer’s USB port; you can use the keyboard while it’s charging. The company claims a single charge should last for 6 to 12 months of normal use thanks to a 1600 mAh battery. I couldn’t test this claim, as the Laptop Pro has just been released, but over a month of part-time use, I didn’t have to charge the keyboard even once—I was using it on its out-of-the-box charge the entire time. Matias boasts on its website that the Laptop Pro is small enough to fit in your laptop bag. At 13.2 inches wide and 6.5 inches deep, that may be technically true, but the keyboard weighs over 2 pounds, and is 1.4 inches thick at its thickest point. I don’t know about your laptop bag, but that’s a lot of bulk to add to mine. Also, like Apple’s Bluetooth keyboard, the Laptop Pro uses a power-toggle switch that could accidentally be pressed by other objects in your bag. 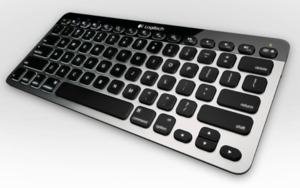 In my opinion, this is really a desktop keyboard—it’s just not as big as Matias’s other desktop keyboards. As mentioned above, the Laptop Pro uses mechanical key switches similar to those in the company’s Quiet Pro keyboard, so while they’re much less “clicky-clacky” than the keys on the Tactile Pro, they’re still noticeably louder than the keys on a typical keyboard. The keys have a nice, tactile feel, though the noise-damping design results in a slightly mushier feel than the keys on the Tactile Pro. And if you’re used to the low-profile keys of Apple’s current desktop and MacBook keyboards, it’s worth noting that the Laptop Pro’s keys require significantly more effort to press. For lovers of mechanical key switches, that’s a good thing, but for this user—who once swore by mechanical switches but has spent the past five years or so using low-profile keyboards—it meant a period of adjustment each time I switched to the Laptop Pro. In short, this is clearly a mechanical-switch-lover’s keyboard. Some of the Laptop Pro's key labels. The keys themselves are nicely sculpted, with slightly raised left and right edges to better “hug” your fingertips. As with all Matias keyboards, each key sports labels for both its character and any special characters you can type using modifier keys. 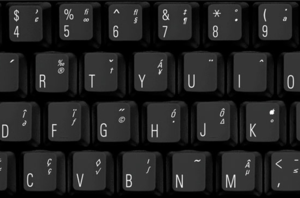 Characters typed using the Option key appear just to the right of the key’s main character; those typed using Shift + Option appear in the upper-right corner. If you’ve ever used Apple’s Keyboard Viewer utility to figure out how to type the ® symbol, you’ll love this feature: Glance at the keyboard, and you'll see that you just need to press Option + R.
Unlike with most keyboards, the Laptop Pro’s key labels are laser-etched, so they won’t wear off over time. The company also uses anti-ghosting circuitry, meaning that no matter how many keys you happen to press simultaneously, or how fast you type, all key presses are recognized. The Laptop Pro gives you a full complement of keys, including 12 F-keys, in a standard layout. A welcome nod to keyboards of old is that those F-keys are arranged in pods of four and separated from the main keyboard, making them easy to locate by touch. And if 12 F-keys aren’t enough, the left-, down-, and right-arrow keys also function as F13, F14, and F15, respectively, when used with the fn key. Several of the F-keys also act as OS X special-function buttons (either alone or in conjunction with fn, depending on your setting in Keyboard preferences): F1 and F2 change display brightness down and up, respectively; F3 brings up Mission Control; F4 shows Dashboard; F7, F8, and F9 act as Previous, Play/Pause, and Next media keys, respectively; F10 is Mute; and F11 and F12 are Volume Down and Volume Up. One of my favorite things about the Laptop Pro’s layout is that while most compact keyboards omit every key to the right of the Return key except the directional arrows, the Laptop Pro preserves some of these useful keys. Specifically, by making the Laptop Pro a bit wider, Matias has left room for Forward Delete, Page Up, and Page Down keys. Plus, the arrow keys aren’t tucked into a cramped space beneath the Shift key—they’re pushed out to the right a bit, allowing them to be full-size keys. Another nice touch is that the Page Up and Page Down keys serve double duty as Home and End keys, respectively, when used with fn. My one layout beef is the location of the fn key, which is just above the right-arrow key and just to the right of the up-arrow key. Without the fn key there, it would have been easy to quickly find the inverted-T group of arrow keys by feel. Instead, I frequently found myself pressing fn when I was trying to press a directional arrow. Though its name implies laptop use, the Laptop Pro is anything but a laptop-specific keyboard. In fact, its thick design and hefty weight make it only marginally portable. Rather, the Laptop Pro is for anyone—laptop or desktop user—who loves old-school, mechanical-key-switch keyboards but doesn’t want to sacrifice a huge swath of desk space to accomodate one. 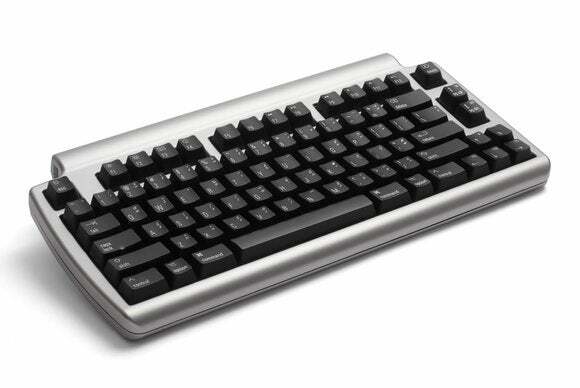 Similarly, it should appeal to those who’ve been pining for a retro-style keyboard without the retro cables. If you're in either group, and you’re willing to pony up for the premium price, the Laptop Pro is worth serious consideration. Updated 7/29/2013 to correct error about the symbol on the Escape key. Also corrected reference to the F15 key, which is an alternate function of the right-arrow key, not the up-arrow key. If you love mechanical-key-switch keyboards but not the space (or the cables) they usually require, the Laptop Pro is for you.